Don't know what to blog about this 2015? Well, we are all in the stage of having that exhausted feeling from the Holidays. Feeling tired at all and you don't have that strength to think a nice title for your blog post or topic to discuss at all, but it is good to know that there is a site that willing to share and think of a nice blog title and idea for us. A HubSpot is an inbound marketing software platform that helps companies attract visitors, convert leads, and close customers. 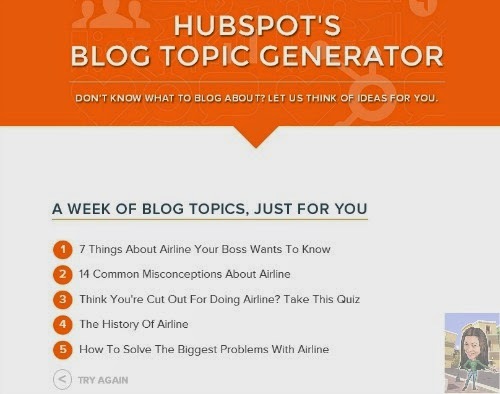 And aside from that they help bloggers and writers to make a BLOG TITLE and IDEAS through their tool, the HubSpot's Blog Topic Generator. How? You can see at their site a BLANK BOX. Fill in the fields (preferably nouns) that you like to WRITE ABOUT. And they will generate a week's worth relevant blog post title in a matter of seconds. For example: I think about a common noun word "AIRLINE". You can think of another noun words, it's up to you. But here in my example, I only use "AIRLINE". 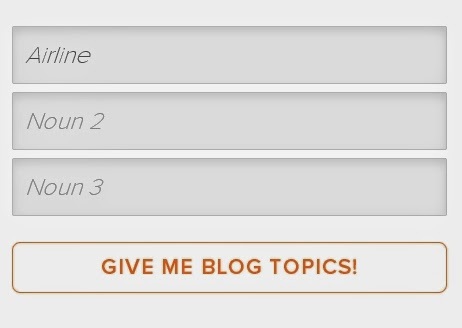 And click GIVE ME BLOG TOPICS! You have to choose which fits your idea, though their algorithm is not that perfect, as written in their disclaimer post, you can tweak the title to be more relevant to your terms and grammatically correct. Do subscribe for a year's worth of ideas now. Fill out the form HERE to get more topics.